Bill Peterson joined the Army at age nineteen early in 1967. His goal was to be a helicopter pilot, but he wound up serving as a crew chief on a Huey in Vietnam after he completed Basic Training at Fort Bliss and AIT at Fort Eustis. Peterson tells his Vietnam War story in Missions of Fire and Mercy: Until Death Do Us Part (CreateSpace, 302 pp., $21.99, paper), a memoir that includes many of the letters he wrote home from the war zone. 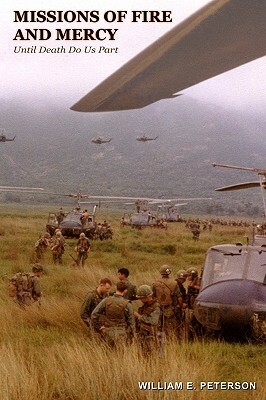 For the next twelve months Peterson put in an action-heavy tour of duty with C Company of the 227th Assault Helicopter Battalion in the 1st Cavalry Division based in An Khe and later at Chu Lai and at Camp Evans. He wound up being awarded thirty-six Air Medals (two with valor) and three Purple Hearts. 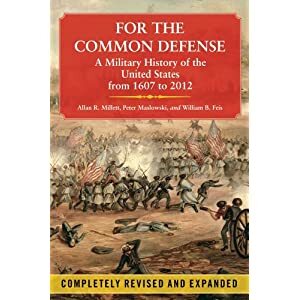 The title of the book refers to the fact that Peterson’s unit flew many different types of missions, including combat assaults and medevacs. This volume focuses on the Cold War and its aftermath. 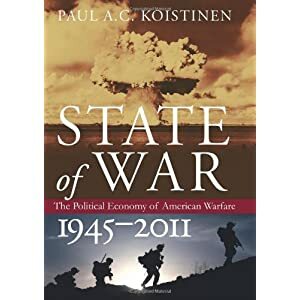 Koistinen—who is an Emeritus Professor of History at California State University, Northridge—concentrates on what President Eisenhower famously termed the “military-industrial complex,” and how it has influenced war and peace in the United States since the end of World War II. 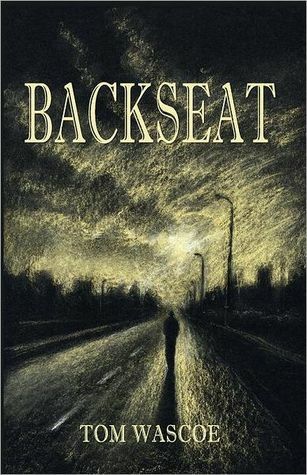 Tom Wascoe served in the U.S. Army in the Vietnam War, but no further information is given about his tour of duty on the jacket of his novel Backseat (Bookstand Publishing, 168 pp $24.95, hardcover; $15.95, paper) or anywhere else I could find. Wascoe received an MBA after his military service, then spent thirty-five years in Human Resource work. We are told that this is Wascoe’s debut as a fiction writer. Backseat is set in 1969. After the hero Michael’s freshman year in college—which was no great measure of success—he embarks upon a 1,500-mile road trip as a weekend challenge, part of his fraternity’s Hell Week hazing. He and another pledge are required to get to the town of California, Pennsylvania, to a brother fraternity and get a signature of the fraternity president. They are allowed only ten dollars each for expenses. Michael’s companion for this ordeal is a total jerk named Randy, who is a perfect pledge in every way that Michael is not. Randy is a cool guy, a jock. Michael is a nerd. Backseat is the story of the trip, who the guys get rides with, and how it changes Michael’s life and goals. The book is beautifully produced, with a striking cover, and is well-edited. It mostly reads like a young adult novel, which is not a bad thing. We know Michael is also aware of the National Guard option because the driver of one of his rides explains to him when Michael asks that he avoided the draft by joining the Guard. “My father had some political connection through his work and was able to assist me,” the guys says. I know there were fathers of that sort. I just didn’t have one or ever met one. That was a factor of my humble origins. So this book provides a glimpse into how the “other half” lives. That’s the half that George W. Bush and his ilk lived in. Wascoe has written a credible novel of how a young man deals with the challenges of college life in late 1960s America. I think Michael will learn lessons of an even more powerful sort in the next stage of his time in the 60s—in the Vietnam War. Good luck to him. I hope that Wascoe produces a book about that adventure. Christal Presley is the founder of the United Children of Veterans. She has a PhD from Capella University, and works for the Atlanta Public Schools as an instructional mentor teacher. Thirty Days with My Father: Finding Peace from Wartime PTSD (HCI, 264 pp., $14.95, paper) is her first book. When Christal Presley’s father (Delmer Presley) was eighteen, he was drafted into the Army. He went on to serve in Vietnam in the Americal Division with the 1st Battalion, 6h Infantry, and was present when the bodies were dug up at My Lai. Delmer Presley carried a PRC-25 radio. He returned home from the war with PTSD, and while the author was a child, her father spent much of his time locked in his room with his guitar as his companion. Christal Presley grew up “walking on eggshells,” she says, frightened of her father’s rage and depression. Periodically he would grab his rifle and tell his wife and only child that he couldn’t take it anymore and was going to go to a nearby river to kill himself. Thirty Days is based on conversations the author had with her father over a thirty-day period, along with the childhood memories that those conversations provoked. Christal Presley called her father once a day for thirty days as an exercise in healing her emotional issues caused by growing up in a family with a wounded Vietnam veteran for a father. Her father accepted the telephone conversation project and agreed to answer his daughter’s questions honestly, telling what he actually did in Vietnam. These conversations dredge up memories of the war and also memories of his return. The topics of the father-daughter, far-ranging conversations included: punji stakes, My Lai, Agent Orange, VC tunnels and tunnel rats, firebases, a nurse being killed in her hospital, and Puff the Magic Dragon, the function of which gets somewhat garbled in the retelling. The coming-home memories are dominated by Delmer Presley’s recounting of his airport greeting by anti-war protestors, where “people were lined up in the hundreds, holding signs that read “Baby Killers,” spitting all over the boys still in their uniforms.” The “Baby Killer” reference comes up again in the book, near the end, so the reader knows that it was an important memory for Delmer. His memory of this spitting also is a powerful one. I would love to see the news footage of such an event. Where has that footage gone? The bulk of the book consists of the conversations, but at the very end Christal Presley goes the extra mile—actually much further than that—as she travels to Vietnam and stands on the ground that where her father had fought on decades before—Marble Mountain near Danang. She also visited treatment centers for disabled children and Agent Orange victims. Delmer Presley is a survivor of shingles and Agent Orange-caused tumors on his lung and his guitar playing fingers, but he lets nothing stop him. He is a talented singer/songwriter/guitarist, who is in great demand to perform at funerals and other services, much of it related to the Vietnam War, and he proudly wears a hat, which proclaims: “I am a Vietnam veteran.” Christal also wears a hat that announces she is the daughter of a Vietnam vet. The Presleys are a family of survivors. Christal Presley was happiest as a child when she was with her dogs. She admits that that is still true for her, and that “playing with Arthur and Duma” is one of her main pleasures. I recommend this powerful book to anyone who wants to better understand the personal aspects of post-traumatic stress disorder. Little Bird Dog and the Big Ship (AuthorHouse, 44 pp., $21.99, paper) is the first volume in what author Marjorie Haun calls her “The Heroes of the Vietnam War” series of children’s books. 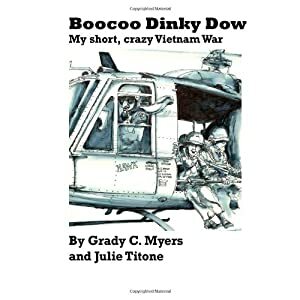 This short book, illustrated by Stephen Adams, looks at former South Vietnamese Air Force Major Bung-Ly and his escape from Vietnam with his wife and five young children during the chaotic last day of the war, April 30,1975. Bung-Ly gathered up his family in the middle of the night as the North Vietname se took over. The family left South Vietnam aboard the Major’s Cessna 0-1 Bird Dog. After dodging machine gun fire over Con Son Island, Bung-Ly flew the plane out to the South China Sea, where—after more than a few harrowing moments—he landed safely on the deck of the U.S.aircraft carrier Midway. “South Vietnam had been a peaceful nation and its people were very kind to America. But enemies from the North fought for years trying to overrun the beautiful, tropical country which was home to farmers, fisherman, and merchants.